I had so many big plans for 2018—until I found out Friends is on Netflix. And now my biggest achievement to date in 2018 has been watching two seasons in two weeks. While rewatching the early episodes of the show, I noticed some things that were more striking when seen through a 2018 lens—mainly that Monica is working in a diner while living in an apartment that's a relative palace in NYC. Rachel Green might have been the style icon at the time, but this rewatch, it was Monica Geller's wardrobe I was really into. Monica's main fashion moment in the show was when she spent hundreds of dollars on boots that ripped her feet to shreds. Although, throughout the show, she actually makes a number of sensible style choices. 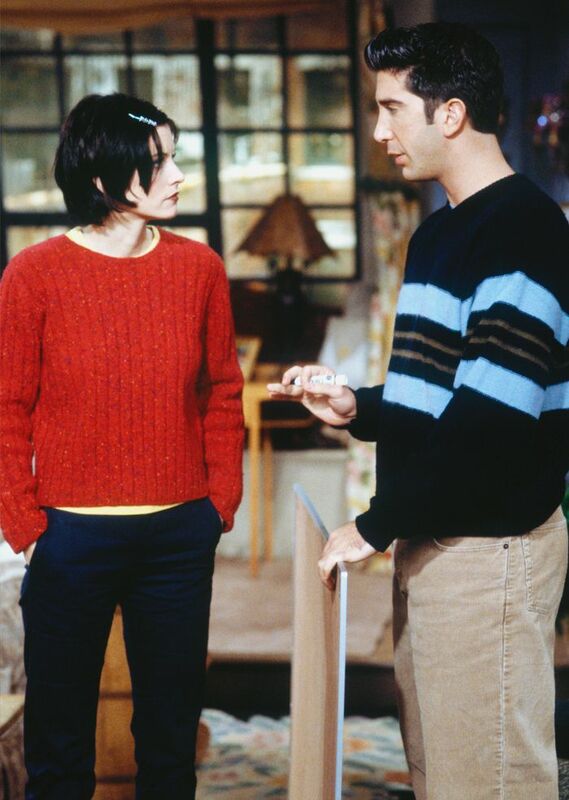 Thanks to Monica, I'm into normcore all over again—just see how chic she makes wearing jeans and a white T-shirt look. She's so committed to her straight-leg jeans that she even wears them to a tap class. Keep scrolling to see the Monica outfits that are worth re-creating in 2018. Style Notes: Red cable-knit sweaters and hair slides are high on my shopping list this year. Style Notes: Monica spent most of the early series in straight-leg jeans, black ankle boots and T-shirts. Style Notes: Vintage floral prints are another Monica signature, and this skirt looks amazing paired with a short-sleeved oatmeal knit. Note how she layers her necklace over her jumper like all the It girls are doing right now. Style Notes: I'll take one of those cosy jumpers too. Style Notes: Monica wore a floral button-down dress with a net shopping bag way before the Instagram set started putting oranges in see-through bags. Style Notes: We told you Monica was committed to her straight leg jeans. Here she wears them with a navy jacket to tap class. The most anti-exercise exercise outfit ever. Style Notes: This is making us rethink normcore, as Monica's black maxi skirt, white T-shirt, denim shirt and backless loafers look so effortless together.